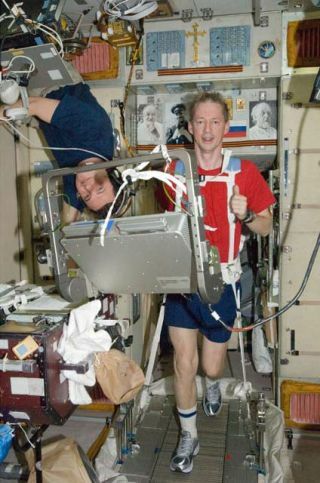 Belgian astronaut Frank De Winne (right) of ESA exercises on a space treadmill inside the Russian Zvezda Service Module of the International Space Station. Cosmonaut Roman Romanenko, flight engineer, is at left on June 20, 2009 during the Expedition 20 mission. Spacewalks,extreme G forces, micro-gravity - astronauts must be able to handle it all.Staying hydrated and healthy is crucial. To helpastronauts avoidmuscle fatigue and dizziness from dehydration, NASA scientists developed anelectrolyte formula that is now available for weekend warriors and athleteshere on Earth. The formula is a concentrated liquid that when mixed with water quicklyrestores hydration and prevents fluid loss. Scientistsat NASA's Ames Research Center in Moffett Field, Calif., put 15 years ofresearch into the drink's development. NASA astronauts have been drinking theformula on missions for nearly 20 years. The commercial version was licensedto Wellness Brands Inc. of Boulder, Colo., and branded "The Right Stuff. "They shipped their first orders on June 11. "Wedeveloped the hydration formula to perform optimally under the most extreme conditions.The health of our highly trained astronauts was paramount," said JohnGreenleaf, a former Ames research scientist and inventor of the formula, in arecent statement. "With all that Americans and the government haveinvested in the space program and our astronauts, this is one clear way toprotect and maximize that investment." A NASAstudy from early in the drink's development found that the drink boostsendurance by 20 percent compared to water alone or drinks containing carbohydrates. Duringexertion, whether on a space mission or at a softball game, yourbody sweats and loses water, which throws your cells' electrolytes out of balance.The formula works by restoring these electrolytes through a NASA-patented blendof sodium chloride (sea salt) and sodium citrate, making the drink isotonic,meaning it helps the body maintain the right amount of water on the inside andoutside of its cells. The formulawas developed without sugar or carbohydrates because they interfere with thebody's electrolyte absorption, said David Belaga, president and CEO of WellnessBrands. The NASAversion of the formula has a naturally salty taste, "about same level ofsodium as a cup of chicken noodle soup," Belaga told SPACE.com. Toimprove taste, sucralose, a zero-calorie artificial sweetener, has been added. Sucralose,while derived from sugar, is not recognized as a carbohydrate by the body andis not metabolized, Belaga said. Video - Recycled Space Urine, Drink Up!